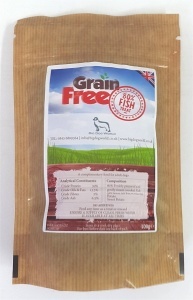 Big Dog World Grain Free dog treats contain 80% freshly prepared fish. They are highly palatable and digestible, and the recipe is perfect for dogs with sensitivities or intolerances to grain. Ingredients: 80% Freshly Prepared and Gently Steam Cooked Fish (32% White Fish; 24% Salmon; 23% Trout; 1% Salmon Stock); Potato; Sweet Potato.